Encountering lions is always a highlight of any Tuli safari. The lion is Africa's largest cat and is also the most powerful, aggressive and dominant predator in the bush. Lionesses form the heart of the pride and are the hunters, the mothers and the nurturers of the cubs. The pride is extremely territorial, with the males fiercely defending their home range from other Lions, especially roaming males looking to take over the neighbourhood. Lion's mark their territories with urinated parameters, scent-marking the ground and deep throated roars to signify that the area is occupied.Lions are tactical hunters, strategically ambushing and bringing down their prey, singly or in teams depending on the size of the kill. 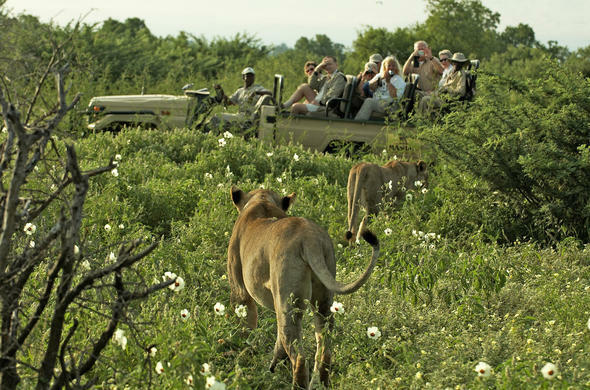 Along with the existing cover of long grass and thickets, their tanned coats allow them to remain camouflaged for just the right amount of time before pouncing.Lion prey on a wide variety of animals ranging from small Warthog, to Kudu, Zebra, Wildebeest and on the rare occasion, includes Buffalo, Giraffe and Elephant. Most hunts take place in the dark, giving the Lion's the edge with their amazing night vision.Lions will feast on a particular carcass for however long it takes to satisfy their appetites, and have a feeding hierarchy, structured in such a way that the strongest most dominant males eat the prized parts of the kill, followed by the females, younger lions and cubs. In the Tuli area what can often be heard is the frightening roar of success over a kill by male Lions followed by a particular series of grunts of satisfaction.These long distance roars travel and spread across the vast plains of Tuli, alerting Jackals and Hyena to the fact that there has been a kill. Consequently Lions often need to defend their kill from these other predators. After the hunt, Lions tend to wade across the vast majestic land, relaxing under the enormous trees to regain their energy and moving towards the water holes as they do not receive enough liquid from the fluids of their kill.Lions reach maturity by the age of 5 and can live for up to 10 years or more, with dominant younger Lions continually taking over the leadership. They dominate the females and weaker older males.Rare Black Manned Lions are quite common in the Tuli area and draw lots of tourists and experts who are studying them. It would seem that they are dominant over Blonde Manned Lions, and that the Lionesses seem more attracted to the Black Manned Lions. Due to their great strength and rarity they are an absolute highlight of a Tuli Block safari.